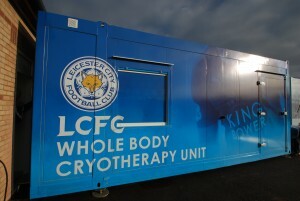 CryoAction client, Leicester City Football Club, currently topping the English Premier League, have taken delivery of their new Whole Body Cryotherapy chamber. The unit will be in use as a key component of Leicester City’s recovery and rehabilitation programme for the club’s first , U-21 and academy team players. 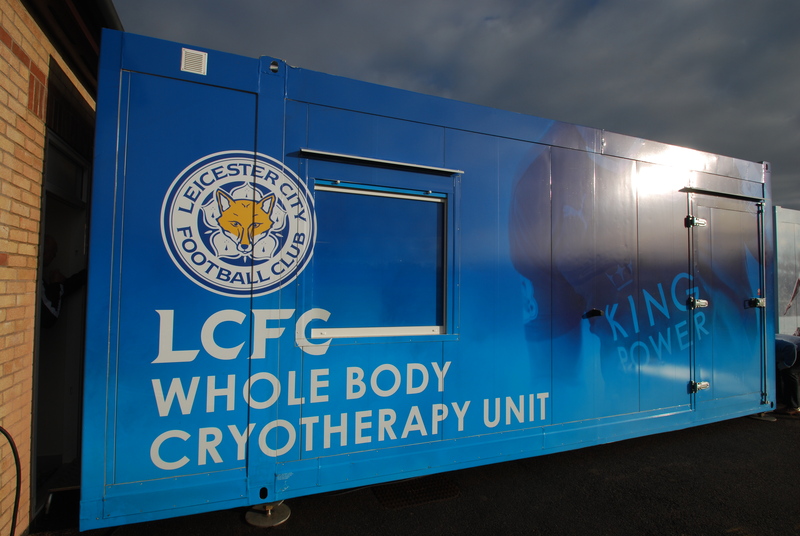 Leicester City Football Club – Cryoaction’s transportable whole body cryotherapy chamber. The 7 metre purpose- built unit has been installed adjacent to the club’s gymnasium and features a number of special features designed to take full advantage of the new equipment. While in the chamber, the players are treated for the fatigue from intensive training, match day exertions and travel tiredness as well a counteracting any soft tissue injuries that they may have picked up. The players’ body reacts to the extreme cold with a natural reaction called vasocontriction. This process works by cooling the surface of the skin and the underlying tissues, causing the narrowing of blood vessels and counteracting inflammation, a biological response of tissue and cells to injury and cellular damage. Inflammation is a protective attempt by the body to reduce the impact of soft tissue injury and to kickstart the healing process. However, the same receptors involved in pain are also present in inflammation, leading to a cyclical reaction causing the inflammation. These chemical signals released by damaged cells result in dilation of blood vessels, accumulation of white blood cells, warming of tissue and swelling. Cryotherapy combats their response by constricting the blood vessels, thus decreasing inflammation. As well as reducing the swelling and resulting pain, cryotherapy can also reduce the loss of function, the potential for muscle spasms and decreases the impact of any long term cellular damage. The club has enjoyed the use of a loan unit since pre-season and the use of whole body cryotherapy has become an integral feature of the club’s training programme, with most players accessing the unit on a daily basis. We wish Leicester continued good fortune for the season ahead.